This year I attended my 19th British Grand Prix at Silverstone and it occurred to me how unique this event is. Having been to Grands Prix in Australia, Monaco, Singapore, Italy and Spain, there’s still something wonderfully British about F1’s home race. It offers a true festival atmosphere yet suffers from being one of the most highly priced races in terms of ticket cost and always faces an uphill battle against traffic and the good old British weather. I’ve previously written about the cost of a European Grand Prix and Monza on a budget, now here’s my guide to the British Grand Prix. Just how expensive is the British GP? My experience in Barcelona this year taught me that if you really wanted to, you could hop on an Easyjet return flight and attend the Spanish Grand Prix for barely more than it costs to attend the British event. Now I must say that the Catalan event far exceeded my expectations and the weather was predictably sublime, but I would still hesitate to recommend it over Silverstone, particularly if you’re British and have never been to your home race. Ticket prices for Silverstone are indeed some of the most expensive on the calendar and you can pay crazy money for the top-dollar grandstands. But this is where you need to be sensible. Every Grand Prix I have been to I have picked a grandstand or viewing area that was far from the most expensive yet had a view and experience that was more than adequate. There’s plenty of videos and photos online showing the view from each grandstand, and Silverstone are good at giving discounts to those who book early, or in my case this year those who book late. A few weeks before the race the circuit did a special 44% discount on all tickets (in celebration of Lewis Hamilton’s car number 44) and I got a Sunday general admission ticket for £86.80 – bargain. If you book pre-Christmas for the following year’s race you can get a three day ticket for general admission for £120 and a selection of grandstands for £199 for the Sunday or £250-£300 for three days, with the most expensive being £450. Grandstands are fantastic and I always pick them when I go to new circuits as you don’t have to worry about saving a spot and you are elevated providing better views, but at Silverstone this year I got to the front of general admission by the fence no problem despite a sellout crowd. For larger groups this won’t be so easy. Now of course this is England and a covered grandstand will keep you from getting soaked like I did – but then that’s all part of the British GP experience! The main straight is the place to be at the start but you will pay for it. I’d recommend Club, the final corner on the new circuit configuration, which has good views of the cars entering the pitlane and good access for the podium rush at the end. Abbey and Farm are also good for the start of the race apparently. My old favourites are Copse, Becketts and Luffield, but Stowe is a good shout for watching the cars at speed down the Hangar Straight. This year I just attended for one day, but for years when I went with my Dad and brother we slept in the car in the car park by Copse corner (then the first corner on the track). Raceday morning I would run with the chairs to Luffield to get the best spot. These days my Dad and brother camp at a cheap site run by a local farm – not Silverstone themselves – on Dadford Road, within walking distance of Club corner. They pay £80 for a three night package and an extra £20 for the Thursday night. As I was doing a day trip from London, I took a Megabus for £34 from Victoria, which left at 07:30 and arrived half an hour early at 09:30. Despite queues to get in the circuit, coaches seem to get priority when it comes to getting in. Trains are available from Euston to Milton Keynes or Northampton but I found the direct-to-circuit coaches far more straightforward. The coaches start leaving the circuit from 16:00-16:30, giving you time to get on the track for the podium and walk the circuit after the chequered flag has fallen. Food and drink is expensive but there are so many options these days. Bring you own picnic and water to ease the cost. There is champagne and food from all over the world available but you will have to pay for it. The facilities have generally improved vastly though of late – there are now plenty of loos but do prepare for a heatwave AND rain – this is Britain in July after all. Bring a radio and tune into 87.7FM for circuit commentary, although since the F1 engine noise decreased in 2014, the PA is more audible. I’d recommend downloading the free F1 app (there is a paid one, but with giant TV screens it’s pretty easy to keep abreast of the action without it) and keeping up to date on the rolling live BBC F1 text website if you need it. Remember – if you can’t tell a driver from his team mate, use your £15 programme to see which car has the yellow dayglow strip on his camera above the cockpit. If you’re there for the whole weekend there’s plenty to keep you entertained. On Thursday Sky F1 have started broadcasting their hour-long F1 Show from the pit straight at 18:00 which you can go watch from the grandstands. There are also the pitwalks in two sessions which are free to three day ticket holders on a first-come-first-served basis. Then for £35 you can see the concert on Thursday night. On the Friday there are two 90-minute free practice sessions, as per other Grands Prix, at 10:00 and 14:00. On the Saturday third free practice runs fro an hour at 10:00 and Qualifying is 13:00-14:00. Post qualifying look out for drivers making appearances and doing talks. Throughout the weekend there are also support races in the form of Porsches, GP3 and the increasingly exciting GP2 series. Race day sees a build up of anticipation like nothing else. Whilst the Red Arrows have moved to Saturday, Sunday sees a display from world-class parachuters and a phenomenal RAF Typhoon that will leave you breathless and partially deaf. 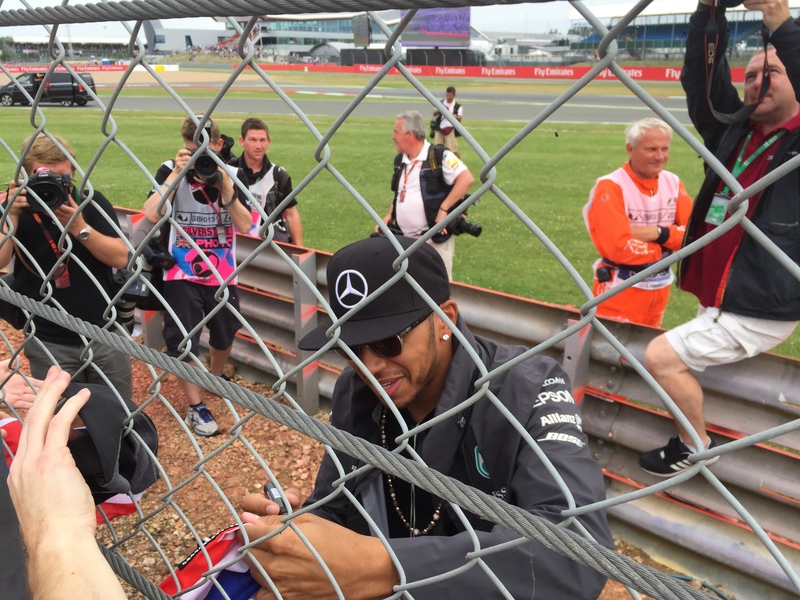 The drivers’ parade is at 11:30 and in 2015 I managed to get to the right part of the crowd fenceline and got Lewis Hamilton’s autograph when he jumped off the truck and ran over to us. The race starts at 1pm and afterwards as I mentioned there is the chance to storm the track with the scrum of people and see the podium before walking the circuit. 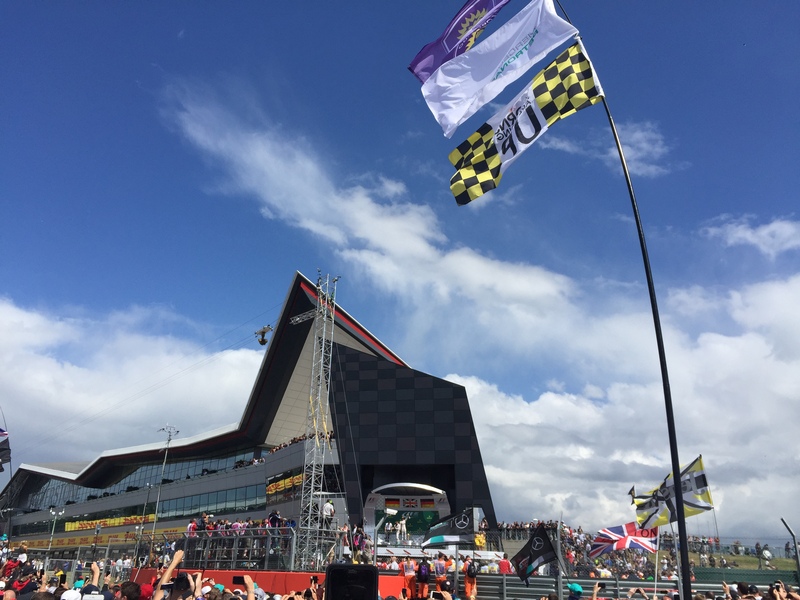 This entry was posted in Motorsport, Travel, Travel Videos, UK and tagged Britain, British GP, F1, Motorsport, Silverstone, UK. Bookmark the permalink. Formula E: thrilling and cheap to attend, but is it any good?